This slippery malaphor is a mash up of “feather your own nest” (use power and prestige to one’s advantage selfishly) and perhaps “know which side your bread is buttered on” (to be loyal to the person who will benefit you the most). “Bread and butter” (someone’s livelihood or source of income) could also be a player here. There is also an Hungarian expression -több mindent jelenthet – roughly translated “butter one’s bread on both sides” and meaning leaving nothing for others to argue or complain. My ol’ pal indicates “buttering your own bread” (using power to gain income selfishly) may also be part of this mix up. Fascinating explanation and interesting new saving! 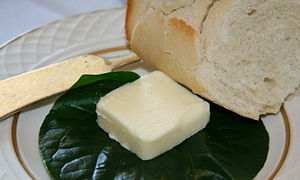 “Butter (someone) up” in the hope that he or she will favor you in return.